Brokenman said that you need to build over xfce. I was working from kde5 but now use xfce. francois, need to test my module from xfce. These packages are in all desktops by default. Why are these packages present? 1.0 I have removed 1), these were on ahau's 3.1 version and 2) libx*, you are right they are not necessary. But qt3-3.3.8b-x86_64-5_slonly is the package provided by usm and available in in pkgs.org for slackware 13.2. Once removed and without my genuine gimp-solibs from gimp only libraries the module goes down to 90,3 MB. Creating my own Porteus ! I realize that I have always built my personal modules the lazy way. Your module works for my brother printer. However, simple-scan will not locate my printer scanner. and will not scan. Comparison of missing packages in our modules. I think that need standard list packages of printing module. This is what I did in the previous post. I used the two lists that you gave and then compared the them (your package and mine) and gave the result of the differences. What I will do is use your module set of packages and then add and remove my extra packages until I get to scan with my brother printer. And provide the result. We will keep what will be left and testers will tell us if anything is missing. I will do that tonite. This should be in the gimp-solibs of ahau. I will have to check that. It might take until this thursday. At work there is a very busy schedule. francois wrote: At work there is a very busy schedule. the same story at me. Printing from cups browser interface works ok. The GUI works for me also. Not sure about the terminal msgs. Both devices does not have drivers for Linux. BTW, Internet via proxy server on the last version of Porteus works fine. 1.0 Your printer package works fine. I finally retested it on a fresh xfce install. Really do not know what was wrong. 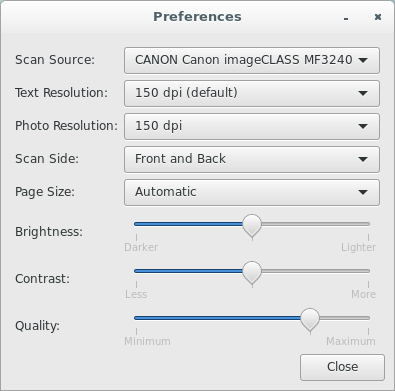 2.0 Canon I-SENSYS MF3228: Canon states that there will be no linux driver for that printer. 2.0 HP Photo Scanner ScanJet G2710: not supported for linux. Better to throw these devices into trash and buy a new printers and scanners with support Linux.